As one of America’s most beautiful and breathtaking states, Alaska is hugely popular with Americans and tourists alike. If you’ve never been, you need to get this place on your bucket list immediately, and, if you have been, make sure you visit again. Only this time, you might consider taking a train trip. We know what you’re thinking – that sounds dull and pointless, right? Wrong! This is a train journey beyond anything you’ve experienced before, and one that is bound to change the way you view the United States. Come with us now, and experience the journey of a lifetime along Alaska’s White Pass by way of the Yukon Route Railroad. You’ll be able to experience things that no car would ever be able to provide you with. It’s the perfect way of enjoying and experiencing another side of Alaska, and really making the most of your time away. So, let’s find out a little more about this trip and how you can benefit from it. The Yukon Route Railroad is a railroad that runs through the heart of Alaska, specifically White Pass. 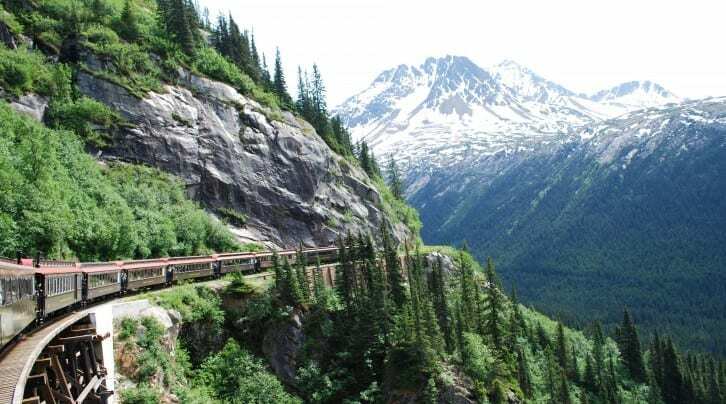 The railway takes passengers on a jaw-droppingly scenic journey up to 3,000 up, and across 20+ miles of Alaska’s natural beauty. This Canadian-U.S. railway is one of the most important in North America and remains popular with travelers. The railway is seen as a gateway between the United States and Canada, as it runs from Alaska in the US to Yukon in The Great White North. 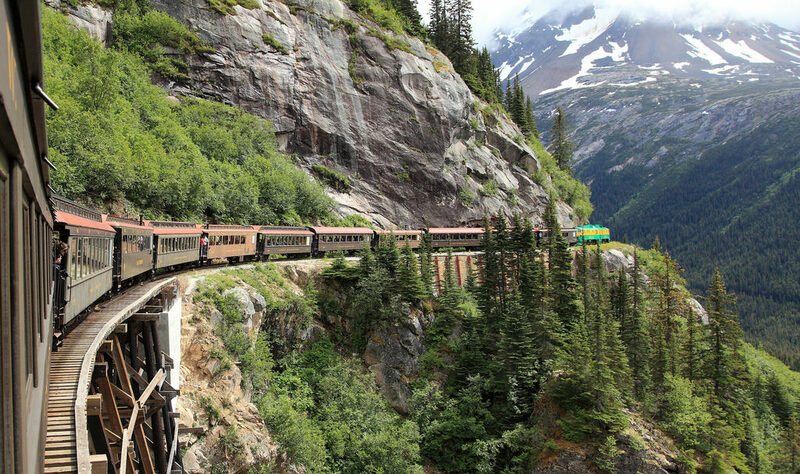 The railroad runs from the port of Skagway in the East of Alaska to the North Canadian city of Whitehorse in Yukon. 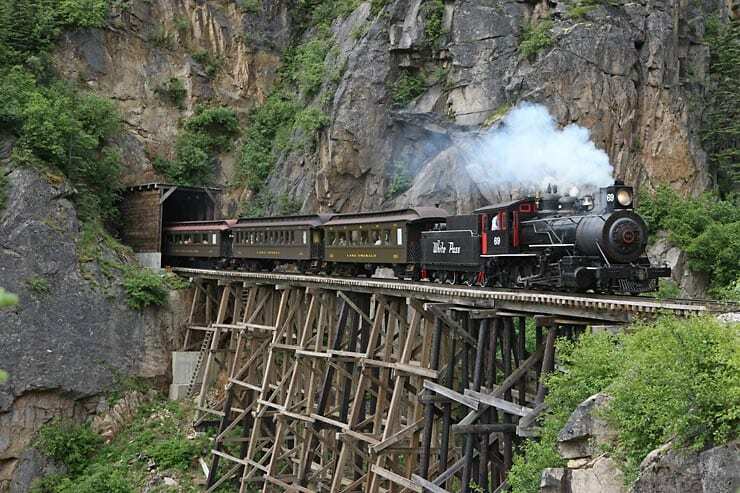 The railroad was built during the late 1800s and used most prominently during the great gold rush of 1900. The purpose of the railway was designed to take prospectors to Yukon, with a view to finding their fortunes. It became the principal route of Yukon and has no direct connection to any other railroad. The railway ran until 1982, when it was closed for a few years, before being revived as a heritage railway in 1988. These days the 40-mile round trip known as the White Pass Summit Excursion takes passengers almost 3,000 to the summit of White Pass. Traveling along canyons and hills, through tunnels, and across mountain paths, this is one of the real treats for anyone wanting to visit the US and Canada at the same time. The journey takes around three hours and is well worth every penny of the $120ish dollars it will cost you. This is truly one of those things you have to experience once in your life – you certainly won’t regret it. There are daily departures running every day, and you can choose the sort of excursion you want to take. Make sure you take a camera with you to capture some of the immense beauty and historic scenery you’ll pass through on the journey. This is the perfect way of starting your trip to Alaska on a sensational note. It will be hard to top the views you get here, but it will also set you up perfectly for The Last Frontier.